The two 1.4-litre petrol versions will cost Rs 6.17 lakh and Rs 6.98 lakh while the diesel options fitted with the 1.3 Multijet engine will be priced at Rs 7.10 lakh and Rs 8.35 lakh. The car will roll out of the Ranjangaon plant near Pune. The Chief Executive Officer, Mr Rajeev Kapur, said the annual sales target for the Linea was 24,000 units in the local market while 3,000 cars were earmarked for exports. 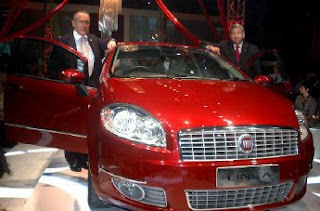 The car is equipped with Fiat’s renowned engines and we hope to make inroads in the C+ segment. Mr Rajiv Dube, President, Tata Motors’ passenger car business unit, and FIAL Board Member, said Linea was an “appealing product” which would do well in the domestic market in the long term. Industry experts say that the sales target for the car is “ambitious” especially with the current slowdown. The Linea will be part of the Tata-Fiat joint retail initiative which involves 70 dealerships currently and going up to 100 by the middle of this calendar. Workshops will also accompany these retail outlets.